Some women choose to pump and store their breast milk. You may decide to do this when you return to work after maternity leave. It allows you to continue to feed your baby breast milk through a bottle. You can buy or rent an electric or hand-operated breast pump to use. Some hospitals and insurance plans provide one for free. This article answers common questions about pumping and storing breast milk. When should I start to pump? If you plan to pump when you return to work, start practicing 1 or 2 weeks in advance. This helps you learn how your pump works. You can pump right after your baby eats or between feedings. Or you may prefer to pump from one breast while you feed your baby from the other. Starting at home also helps you build a collection of breast milk. You can store it for your baby’s feedings when you return to work. How much milk will I get when I pump? You may not get much milk when you first start pumping. This will change as you continue to pump regularly. Your breasts will begin to make more milk. The more often you pump, the more milk your breasts make. Drink lots of fluids to stay hydrated. This will also help your milk supply. How long should I pump each time? It takes about the same time to pump milk as it does to breastfeed. With practice, you may be able to pump in as little as 10 to 15 minutes. While you are at work, try to pump as often as your baby usually feeds. This may be every 3 to 4 hours for 15 minutes each time. To keep up your milk supply, give your baby extra feedings when you are together. 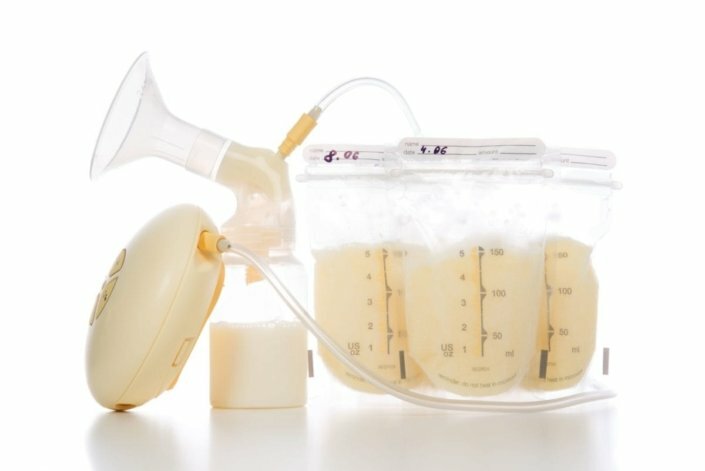 You also can pump right after your baby feeds to help your breasts make more milk. Will there be times that my baby needs more milk than I have ready? Yes, your baby needs more milk during growth spurts. These occur at about 2 weeks and 6 weeks of age and again at about 3 months and 6 months of age. The best way to increase your milk supply for a growth spurt is to breastfeed or pump more often. There are a couple of ways you can store breast milk. You can use a plastic or glass bottle with a sealable top. Or you can use a sterile, sealable bag. Store your breast milk in the amount your baby consumes in a feeding. This way you don’t waste any milk. For example, if your baby eats 4 ounces in a feeding, put 4 ounces of breast milk in the storage container. Always put a date on the container of breast milk so you know how long it will last. Where should I store my breast milk? Store your pumped breast milk in a refrigerator or cooler with ice as soon as possible. You also can freeze the milk if you aren’t going to use it right away. The life of breast milk varies based on how it is stored. At room temperature (less than 77°F), it lasts up to 6 hours. In a cooler with ice packs, it lasts up to 24 hours. At the back of a refrigerator, it lasts for 3 to 8 days. At the back of a freezer, it lasts up to 6 months. Stored breast milk can vary in color. It can be bluish, yellowish, or brownish. It is normal for breast milk to separate (the fatty part of the milk goes to the top). Shake the bottle or sealed bag and the fat should go back into the milk. If it does not, then the breast milk may be bad. You should smell the milk before feeding it to your baby. Bad milk smells sour. If you still aren’t sure, try tasting the milk. If it tastes sour, then it is bad and needs to be thrown away. If you choose to freeze breast milk, you need to thaw it before giving it to your baby. There are 2 ways you can thaw the milk. Put the container of milk in warm water. Swirl the container around in the water until the milk thaws. Put the container of milk in the refrigerator the day before it is to be used. Thawed breast milk can be refrigerated for up to 24 hours, but it should not be refrozen. Do not use hot water to thaw breast milk. The milk could get too hot and burn your baby’s mouth. Do not thaw frozen breast milk in a microwave. This can damage valuable proteins in breast milk. How early after birth can I start pumping breast milk? How long can I pump and store breast milk? What type of bottles should I use to store breast milk? What should I do if my baby prefers bottle-feeding to breastfeeding? What happens if I accidentally give my baby bad breast milk?